Traditionally bolognese sauce simmers slowly in an uncovered pot for at least three hours. 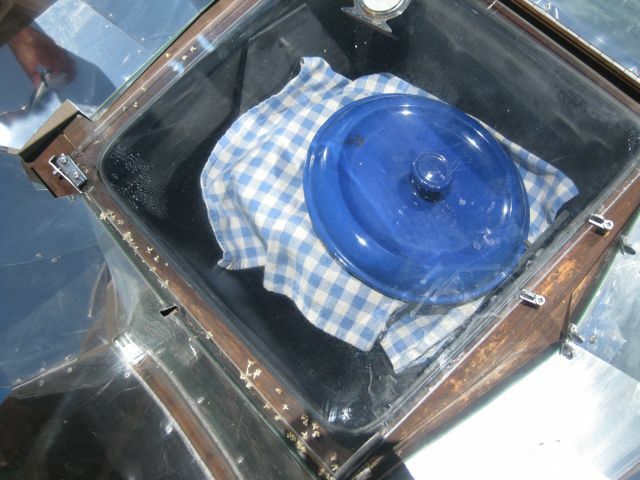 If you don't use a lid in the Sun Oven it will burn on top, and if you do the sauce will be watery. Today I tried a new trick to address both these issues and I may be on to something. I covered the pot with a tea towel and left the lid slightly ajar. In addition to keeping the sauce from burning, the tea towel absorbed some of the moisture. 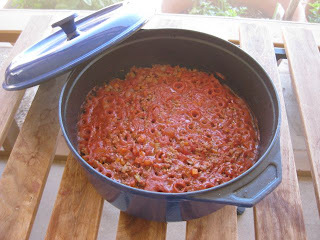 Today's batch of bolognese was my best ever from the Sun Oven. We had some over rigatoni for dinner and there are two containers of it in the freezer for Martin to enjoy while I'm away. By jove, I think you've got it. What about the condensation on the lid? Did the tea towel process stop it from forming near the end? That looks so yummy! There was practically no condensation. Next time I think I'll try just the tea towel with no lid and keeping the temperature around 200º, no easy task when it's 100º + outside.